Felt Pressure Shoe, 5/8" x 2" x 35-3/4"
So why don't more people do it?? The answer is obvious, cost or time involved. There are various ways to achieve an exact reverse profile, if you want to know more - click here. 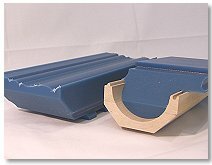 www.feedrollers.com is a division of Wood Tech Enterprises, Inc. Copyright © 1998-2012 Wood Tech Enterprises, Inc. All Rights Reserved. Designated trademarks and brands are the property of their respective owners. Wood Tech is not responsible for typographical errors. Prices are subject to change. All prices are in U.S. Dollars.